Micellar water has been such a huge trend in the beauty community this year! If you are not too sure as to what a micellar water product is all about – to sum it up really quickly, it is a very light and non-harsh toner. You can use this product all over your face, including on the eyes, to tone or to help in removing your make-up. I have personally been using micellar water in my beauty routine for about 2 years now and it has definitely become a staple. I first started hearing about the Bioderma Micellar Water in beauty youtube videos about 3 years ago or so. Back then micellar water wasn’t really a huge thing in the Aus beauty market and wasn’t that readily available. I almost feel like the huge success of the Bioderma product is the reason why so many brands have started completing with it by bringing out their own versions at a lower costing. I am on my second 500ml bottle of Bioderma Micellar water and it is definitely one of the best beauty products that I have ever used. I will use this to help remove my make-up and as a toner. Sometimes after using a particular face wash or toner, my skin may feel a little irritated and I find that using this product on my face fixes that right up and calms my skin down. I will always always use this on my face right before I put on my nightly moisturiser just to make sure that any left over make-up, dirt etc is gone and the results are really great. It is a super light product on the skin but really does pick up so much make-up, oil, dirt or whatever is on your face. I am just about through my first bottle of the Garnier Micellar Water and have been using it for about 2 months now. I have used it in the very same way that I have used the Bioderma version. This product also works really well in regards to removing make-up and lifting off any dirt or left over product residue from my skin. I have no troubles with using it all over my skin, including over my eyes to remove eye make up. I did purchase the smaller bottle as I wanted to test it out before committing to a bigger bottle. Lets get down to the comparisons! These two products are SO similar it is not funny. 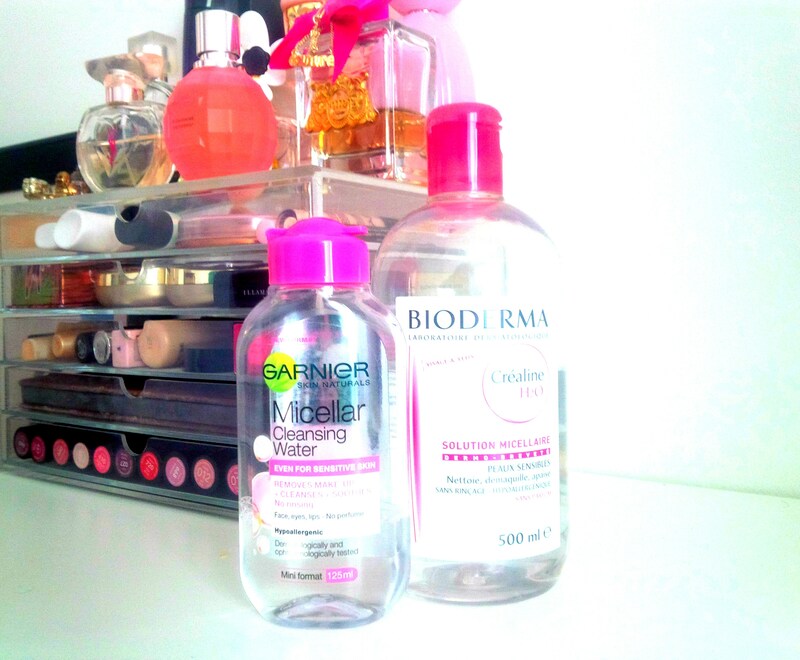 If you are after a dupe for the Bioderma micellar water – I definitely recommend the Garnier version. I find the Bioderma to be ever so slightly more calming than the Garnier but I guess this is one of the reasons why there is a big price difference between the two! In Australia, you can purchase the 500ml bottle of Bioderma micellar water for $40.00 full price at Priceline. The 400ml Garnier version is also available at Priceline at the cost of $13.00 full price. This is a HUGE price difference! Yes the Garnier is a 400ml bottle and the Bioderma is a 500ml bottle so there is that difference of 100ml but you save $27.00 if you decide to go ahead with the Garnier. Something that I do find a little odd is that according to the back of the bottles – the Bioderma has a 12 month use by and the Garnier has a 6 month use by date. If I had to absolutely choose between the two and cost wasn’t an issue – I would go with the Bioderma. My reasons for this are yes it’s expensive but one bottle lasts me about a year and this product does calm my skin down a little more than the Garnier. It really does come down to how your skin reacts to these products and what price point you are looking at but there is absolutely nothing wrong with the Garnier and I would re-purchase both products in the future again without any hesitation!